Private room on the second floor of this astonishing three bedroom townhouse. Shared bathroom with other Airbnb guests. Only 10 min walk from Union Station and 20 min walk from the Capitol Building and the National Mall (Smithsonian Museums, Monuments). The room has a full size/double bed. We do rent out two rooms so the bathroom on the floor is shared. The room has a full-size bed that comfortably accommodates 2 people. There is a bathroom down that hall which is shared with guests from a second bedroom listing. We ask kindly not to smoke inside the house. Check-In: Please note that if you arrive during a weekday, check-in will be at 7 pm or later. If you arrive earlier we can provide you with access to the house so that you can drop off your bags and return after 7 pm, when the room will be ready for you. During the weekends you can check in as early as 3 pm. If this is a problem for you please send us a message and we will do our best to accommodate you. Check-out: 10:00am weekdays and weekends. Bon emplacement pas loin de Union Station et du Capitole... Maison propre , check-in simple et accueil chaleureux avec plein de bons conseils. Même si Irik travaille beaucoup, il a pris le temps de discuter et prodiguer de précieux conseils! Tout est comme décrit, pas de surprise. L'emplacement est idéal pour ceux qui ont ensuite une correspondance à union station en bus ou en train en restant très près du capitole. Le logement est propre et les hôtes très accueillants. Nous n’avons passé qu’1 nuit chez Irik (nous n’avons pas rencontré Zaira) compte tenu du fait que nous restions que 2 jours sur Washington DC. La chambre était grande et confortable. Le logement est situé près de la gare centrale, très pratique si vous veniez en train comme nous. L’appartement reste proche aussi du Mall, possibilité de le faire à pied. Irik nous a bien conseillé sur la ville et les modalités de transport. Nous conseillons ce logement ! This room was great! Easy access to the central part (<$10 uber), spacious, safe, and had a lot of privacy. Room has a desk and closet and queen size bed. Highly recommended. At first I thought this listing was too good to be true, but it is in fact exactly as advertised (or even better)! Quiet, affordable, very clean, cozy, and close to amenities. I didn't have a chance to actually meet Irik and Zaira but they were very organized and responsive to emails/questions. I would absolutely recommend a stay here and would book again if I ever return to DC. Thank you! Great room and location !! Recommended ! Absolute best hosts I’ve ever encountered—warm and friendly and happy to help out with local tips and directions. The townhouse is close to everything and check-in was a breeze. The room and bathroom were sparkling clean and comfortable. Close to Union Station and easy to get to the National Mall and the major tourist zones. Would recommend to anyone looking for a short or long term stay in DC! Please enjoy your appointed private bedroom and office suite in my renovated Victorian with shared bath. You are blocks from the Metro, Starbucks,bike-share,Union Station,NOMA and The H street corridor. I also offer free parking. Thirty days or more, Your stay includes weekly complimentary laundry service (wash and fold ) provide by a local cleaner . Whole Foods and Trader Joe are 5 minute walk from the house. The house is clean, modern and relaxing with tons of natural light . .
My home borders Capital Hill, H street Corridor,Union Market and NOMA. Some of my favorites place to dine are all with in walking distance. Smith Commons,Dr. Grandville, The H Street Country Club,Maketto,and The Burger Board,Wholefoods and Trader Joe. Byron's home was immaculate and located in a very convenient spot which made touring DC by foot very easy. Byron was always extremely fast at responding to our messages. He was also a very attentive and friendly host. He also gave us a lot of privacy which is always appreciated. I would stay at Byron's place the next time I visit Washington. It is by far the best value accommodation in the city that I have come across. Byron is an excellent host, we had a great time. Great location for the price, beautiful house! Antique place, leaving room, kitchen, porche and dining room are in very well conditions. Bathrooms has some opportunities. This really is a great location! It's about a 2-3 mile walk or bike ride into the National Mall strip and close to several dining options (H Street and Union Market were great options). The space was very clean. The room has a lot of natural light which made it also very warm. The weather was in the low 80s during my stay and there's only a loud window AC unit to try to cool down the space after being out all day. Awesome place and great host! Totally recommend!! Byron’s home was clean and very stylish! Unfortunately, we left our reservation early, however I would stay there again without hesitation! Great location close to the metro. Modern Loft Studio in Mt Vernon Triangle right in downtown DC! Sunny living room w/ hardwoods, concrete accents & sweeping city views! Open kitchen w/ SS appliances, quartz counters & breakfast bar. Bldg has gym, concierge, roof deck. Unit comes w/ GARAGE PARKING! 5 min walk to 3 different metro stations: Judiciary Square and Gallery Place and Mt. Vernon Square/Convention Center. The apartment is so well situated that day trips to the mall are almost too easy! Amir is an excellent host and always available to answer any questions in a quick and timely fashion! This is a great location for visiting D.C.'s attractions. If you're at all mobile, most things are within walking distance. The included garage was also a main advantage, although we just parked our car. The apartment is in a great situation, secure with front desk people. Like many city apartments, it is quite small. There is a pet who lives there, but of course wasn't there. We were there during very cold weather; while the windows offer great views and light, they created some inconsistency in the heating situation. This was a great place to stay downtown! Amir is very friendly and helpful. I would stay here again. Amir’s apartment was cozy, clean, safe, and conveniently located. I would definitely recommend this apartment to friends and I would definitely stay here again! Great location to explore DC! Nice and comfy apartment. There's also a lovely rooftop you can enjoy. Convenient location right in the middle of everything the city has to offer. Perfect location for interns , attendees of conferences in DC Convention center or travelers. You can rent a Capitol bike right across the street. If you want free rides around the city just ask me and I'll provide you with the information. You'll be able to enjoy the rooftop. Excellent place, just what I needed with great location. Very comfortable space and close to many locations in DC NW! My experience summed up in one word: REMARKABLE! Jasmine was such a great host because she responding quickly, her place was exceptionally clean and filled with great amenities [i.e., rooftop hot tub, free coffee, wifi, etc..], and it’s a great location for biking or walking to D.C. attractions. Everything was quick and easy. My room was spacious and clean. The building is beautiful and has a very spacious ground floor where all residents can sit and enjoy coffee. The swimming pool on the roof is gorgeous. It is at a top location: walking distance of the subway station and across the street from a grocery store and a bike station. City explorers without a car can be at Union Station or the Capitol in about 15 minutes by bike or subway. Only the fact that the owner asked not to mention airbnb and not to ask the front desk made me feel unwelcome in the building. what a great apartment! so close to the metro and only one stop before union station!!! I was hosted a couple of days at Jasmine's apartment and I was impressed by mainly three features: perfect location to visit the main touristic attractions in Washington D.C. (subway is at 100 metre away, an excellent grocery to buy whatever you need is at 20 metre away, Starbuck for breakfast is just down to the apartment, Union Station is at walking distance, 10 minutes only), a very silent apartment no noisy at all neither from outside nor from inside, excellent cleaning. I would recommend to everyone this apartment. Great location, just 4 blocks from Union Station. Would be great for business or long term travelers. Enjoy a cozy STUDIO in the heart of downtown DC minutes away from the White House, National Mall, and Union Station (Metro). A 3 minute walk to Union Station gives you metro access everywhere! Also, the studio is steps away from Capitol Hill and many other attractions. Great location for business travelers and tourists -- easy access to the National Mall, Smithsonian, U.S. Capitol and offices, and the rest of downtown Washington via Metro from Eastern Market station or Union Station. This cozy studio is the perfect mix between comfort and practicality. You have the entire place to yourself. Hardwood floors and a rug for comfort. Full kitchen with updated appliances, coffee maker, toaster and microwave. Queen size bed, queen size pull out bed, and a desk for work. Cable and high speed internet. Upgraded shower-head in the bathroom for relaxing showers. The apartment is right in the heart of the NOMA district of downtown, Washington DC. With plenty of character, the bustling streets of down town Washington DC are thriving with history and flavor. Around every corner are picturesque views of the Capitol Building. We are in close proximity to many shops, supermarkets and fun and exciting things to do. You can’t find a better place to stay and explore the DC area! I highly recommend! I enjoyed my time in DC and staying in Sarah’s apartment was apart of that experience. If I’m ever in DC again will definitely book again. Sarah’s place is clean, quiet, and very comfortable. It felt more like a hotel in a super nice building. The location could not be beat, literally 5 minute walk from union station. Sarah was very prompt and friendly with all communication. I would definitely stay here again! My stay with Sarah was exactly was I hoped to find for my trip. It was cozy, comfy, and a great value for a solo traveler, or a couple. Space might be a bit tight for four adults. A big perk of this property is location! it is literally a 5 minute walk fo Union Station, the US Postal Museum, Corner Bakery, Starbucks, and so much more. I also loved that it had a locked entrance to the building, as there is a lot of foot traffic on the street. I felt very safe even late at night. Also, super easy to get an uber at all hours due to proximity to Union Station. It is also 10-15 minute walk to Capitol Hill and several museums. The room was very clean, super cute, and very comfortable bed. Will definitely look to stay again when I'm in DC! Sarah was an excellent host with quick responses. Check in and check out was a breeze. Her apartment is in an excellent location and is a one bedroom that can accommodate up to four in two beds easily. Sparkling clean, cozy and such a great location. Sarah made things so easy for us. She responded quickly and kept us informed every step of the way. Great location, wonderful host. Prompt, clean, and perfect for work or sight seeing. 750 sq ft, with brand new EVERYTHING - an open kitchen, big windows & tall ceilings (both of which are rare for basement units). Fire place & ws/dr in unit. 2 Blocks from metro, a block away from Union Market, and step away from H Street night life! Appartement spacieux , identique aux photos, très propre et idéalement placé dans un quartier résidentiel très calme. Ce séjour a été très agréable et Meseret et son mari ont été très attentifs à notre confort et la communication entre nous a été très facile, tout a été facilité : l'heure d'arrivée, de départ et les commodités pour récuperer les clés . Je recommande +++ ce logement , vous n'aurez pas de mauvaises surprises ! Un petit conseil: allez diner au restaurant ethiopien de Meseret (emplacement idéal proche de l'appart à pied) ; la cuisine ethiopienne à été une super découverte pour nous ! tout comme cette ville calme et magnifique où l'on se sent tout de suite très à l'aise . Logement très propre et très bien équipé. Quartier calme. Facile de se garer (août). Meseret est très réactive. Nous étions une famille de 4 et avons passé un.excellent séjour à Washington. Nous avons adore notre sejour dans cet appartement! Refait recemment, il offre tout le confort necessaire et est tres propre. De plus, contrairement a de nombreux autre apparts AirBnB, la cuisine est vraiment bien equipee en vaisselle/casseroles/condiments pour cuisiner. Nous avons apprecie pouvoir laisser la voiture la journee devant la maison grace au guest parking pass fourni et simplement prendre le metro a la station toute proche pour visiter DC. Meseret et Sam etaient facilement joignable et tres a l'ecoute. Le petit plus: les viennoiseries offertes a notre arrivee, et un mot de Meseret recommandant epiceries/restaurants des alentours. Très bel appartement : spacieux, très propre, emplacement idéal pour les visites (10 mn à pied du métro), quartier très calme. Nous avons beaucoup apprécié les petites attentions de Meseret et Sam (comme les pains au chocolat...). Nous recommandons vraiment cet appartement pour un séjour à Washington D.C.
Quartier très sympa, logement très agréable et très propre. Une super attention pour notre arrivée avec des pâtisseries et des jus. Meseret a été très flexible quant à notre heure d'arrivée. Seul point négatif : une ventilation un peu bruyante. Merci! My condo is a perfect place to stay for anyone who comes to work or just to enjoy DC-it is in the heart of the city and minutes by foot to the Capitol and the Smithsonian. You can walk to museums, restaurants, Shakespeare Theater, Verizon Center, a movie theater, galleries, work sharing spaces, fancy stores, etc. The public transportation is very convenient as well as the access to major highways. I am looking for a longer term rental which is minimum 6 months long. The condo is not furnished. Great space! Plenty of room and nice overall experience. Tatjana was a great host. Tatjana's place is quite comfortable for a mid to long term stay. It's well located and the building comes with some nice amenities (gym and roof top patio). I was there for two weeks by myself and had no major issues. For the most part, everything was clean and ready to go. A few things could be updated (bathroom sink and a/c need a tune-up) but in general, this is a great place to stay if you are visiting alone or with a significant other. Tatjana's place was just a cute as the photos, very convenient to everything just as described. I was worried about walking around with a 7 year old, but her place was so close, convenient and safe we had no problem walking everywhere whether it was to Walmart/Safeway groceries or 4 blocks to Union Station. There are plenty of restaurants of all cultures around. There was no trouble hailing a taxi, rail and bus stops are very close by. I knew nothing of public transit but its very easy to figure it out on your phone and all the people are very courteous about giving directions, I didn't get to meet her but we had an entirely positive experience with Tatjana and DC and have every intentions of planning to stay with her again! This was a lovely place to stay. It is fairly close to the major tourists sites of Washington, D.C. but not quite in the middle of it all, which I enjoyed. The building itself is very nice, clean, and quiet, and Tatjana's place was very clean and accommodating. You won't regret staying here. The apartment is beautiful, spacious, comfortable, and within easy walking distance to restaurants, stores, and transportation. Location is amazing! Condo is larger than I anticipated. I would highly recommend to anyone looking for a quiet yet lively location. Tatjana's place was perfect. Close enough to the Capitol and Union Station to walk and it felt very safe. Her place is just as described! All the beds are comfortable and it felt spacious for a family of 4 with teenagers. Loved having a full grocery store within a few blocks walking distance so that we could prepare many of our meals - including using the roof top grill and enjoying the great panoramic view of D.C.! This is a great spot. It is in a great location, has a wonderful charm, and host(s) were very easy to coordinate with. In the center of Washington D.C.'s premier shopping, dining, and nightlife, this up and coming neighborhood is where you want to be. Steps from the Metro, only minutes away including easy access to I-395 and major highways. Join the home crowd and cheer on the Washington Nationals at Nationals Park just two miles away. Catch your favorite show and immerse yourself in the arts just down the street at Atlas Performing Arts Center. Verizon Center is only one mile away. The Space: *Bedroom 1: Plush queen size bed with comfortable mattress *Twin size bed/cot with mattress available *Bathroom 1: Tub/shower combo (ensuite) *Living/dining area with seating for up to six (6). Kitchen is fully stocked with designer cookware, utensils, dinnerware including drinkware for up to eight (8) guests. Includes: Toaster oven, coffee maker with coffee and sugar, and basic cooking supplies. Unit is fully equipped with freshly laundered linens on beds and towels including extra towels for the pool. Extra bed linens as well as extra pillows and blankets for the pull out and cot/air mattress. One bath towel, one hand towel and one wash cloth per guest per stay. Washer and dryer in the apartment with complimentary laundry detergent and dryer sheets. The unit will be stocked with coffee and tea, sugar, and toiletries (soaps, body wash, body lotion, shampoo/conditioner). Hair dryer, iron and board are available. From our guests: “My son and I had a wonderful stay here. It is a very clean, comfortable, and private space.” - Sarah, July 2018 “By far one of the best Airbnb’s I’ve stayed at. :)” - Kristen, August 2018 The building: *High security building with electronic access doors to unit and amenities including elevators. *24 Hour Gym *Lounge area with free WiFi *Rooftop pool (seasonal) with lounge area and fire pits. *Maximum of 4 guests in pool per unit. Rooftop is first come , first serve availability. *Outdoor rooftop has gas grills . *Smart TV *Capital Bikeshare *Walmart and several other attractions on site Guest access Full apartment plus building amenities are included in this rental. Please keep quiet in the hallways, be mindful of your neighbors and make yourself at home. Guests have full access to a wide array of amenities including: * Business Center * Clubhouse * State of the art Fitness Center * Fully secured building * Public Transportation * Swimming Pool * Wireless Internet Access Guest interaction I am available by phone, text or email during your stay, but our level of communication is up to you. You will be able to self-check-in upon arrival. **Concierge services/front desk are reserved for residents only and do not offer any Airbnb guests services. However, myself and/or my co-host will be available for the duration of your stay. Other things to note *Building is only accessible by electronic access. *Only one set of keys (Fob & card) are available per reservation. No exceptions. Key fob and card are $150 each to replace. Please guard safely. *Parking is not provided on site. *This is a residential building. Highly secured. Please be respectful and do not disturb other residents, guests, and neighbors. We respectfully request that no loud noises, music and/or disturbances in general, but definitely not past 9:00 PM. *Quiet hours of 9:00 PM - 8:00 AM is strictly enforced. Subject to removal if in violation of building rules. *Building is only accessible by electronic access. *Only one set of keys (Fob & card) are available per reservation. No exceptions. Key fob and card are $150 each to replace. Please guard safely. *This is a residential building. Highly secured. Please be respectful and do not disturb other residents, guests, and neighbors. We respectfully request that no loud noises, music and/or disturbances in general, but definitely not past 9:00 PM. *Pool use requires pool passes limited to the number of guests in the reservation. My son and I had a wonderful stay here. It is a very clean, comfortable, and private space. My son loved the pool. It also has great view of the courtyard. Located near union station, which made it easy to get to many other locations in Washington, D.C., not to mention it wasn't far from other major sites. Angela and Ron made sure we were set with many extra amenities, and checked to make sure we were comfortable. They were also both very responsive. Would love to stay here again, and highly recommend it. Great apartment. Clean. Good location. Only thing was the homeless people on sidewalks. That isnt owners fault. Great apartment with fully equipped necessities. Clean and neat place! We three enjoyed ourselves and the apartment is very cozy though a little bit small for three. We feel like staying at home, such as cooking chatting, etc. The sofas are so comfortable that we could sit in and lay down for whole night. The apartment is clean and everything is good. Hosters responded immediately when we have any questions. I would appreciate if there is a lamp at the dinner table and less procedures to find the keys. Apartment is very clean and well equipped. Gym access and Walmart next door. This was a fabulous place to stay. Ron was a great host and answered all questions promptly. The place was well decorated, beautiful, modern, and comfortable. The location was about a 12 minute walk to Union Station, which was very convenient for getting around via public transit. I would highly recommend! Location! This is the heart of downtown Washington and 2 blocks to the Metro. See my VIDEO TOUR on Utube. Just search for "Puppy Pillow Airbnb" Take comfort with my 100+ happy reviews. All the details are arranged for you-- staying here is easy and comfy! Location location, location! .2 miles to Metro (subway stop) - connects to Union Station and Reagan Airport (DCA) .3 miles to the Smithsonian Art Museum .7 miles to the National Mall, Capitol, and monuments .6 miles to the Convention Center. -Safeway grocery store is an 8 minute walk. -CVS and SoulCycle are 1 block away. -Awesome restaurant Farmers and Distillers across the street! My apartment is full of light with large windows in every room and an expansive open floor plan. Beds: -Queen bed in the master bedroom -Full bed in the second bedroom -Full size Sleeper sofa in master. -Extra Full mattress stored in walk-in closet. -2 extra air mattresses. -1 couch in living room so you could sleep up to 9 people. Plenty of floor space to spread out. And you'll find extra clean pillow cases, sheets, etc. in the closet. Conveniences: -Washer and dryer in unit. -Full and modern Kitchen with plate and utensils for you to use. You're also welcome to use any condiments you need like ketchup or olive oil. Any sauces or basics like salt and pepper are for sharing. -Full-length mirror -Iron and ironing board -Coffee maker -Hair dryer -Cable TV + HBO Bathroom: -Shower has full size liquid body wash and shampoo/conditioner for you. -The bathroom door is accessible from the living room too-- so you don't have to go through either bedroom to enter. -Plenty of fresh towels folded for you to take as many as you need. The Building: -24/7 front desk concierge for security. -Just renovated gym open 24/7 -Rooftop deck with views overlooking the city. -Outdoor pool -Attached to the lobby is a convenience store with all the essentials. (Wine and beer too!) -Attached dry cleaner if you need to press a suit before a meeting. -Pet-friendly -Bike share station immediately outside building. It's the best way to see the city! Pick up a bike at any station and drop it off at any station. Perfect for sightseeing! Details at Capital Bike Share site. -The luxury building has really great lounges and a rooftop where you can setup a laptop and get some work done or just enjoy a glass of wine. Parking: Street parking with meters. Pay by phone with the app ParkMobile! Also many garages and hotels nearby. For 7+ day stays - please ask about a reserved parking spot I can get you if we plan it in advance.. So many great restaurants! Try Graffiato and you won't be disappointed! LOVE Farmers and Distillers! It’s across the street. Walk to all the museums, White House, Everything! If you're visiting Washington, D.C. with multiple friends and want a centrally-located crashpad for a reasonable price, this may be the answer. Jon's place has plenty of spaces to sleep, ample blankets, bedding, etc. However, if you're a business traveler or seeking something comparable to what you might experience at a four-star hotel or higher, you'll probably be a tad disappointed. The number one selling point for Jon's place is by far location. You're an easy walk or short lyft/uber ride to anything you'd want to do in the city. All the basic functionality you may need is there, but nothing exceptional (such as cable tv). My stay was short and I was only there during the evenings, so it was suitable to my needs. If you're with a group of friends that plan to be in the city more than in the space, you'll likely be very happy. A nice, cozy little apartment near Chinatown. Good location, good host, no complaints. Nice modern apartment within walking distance of most DC sights and restaurants. Great value for this area. Great location - walking distance to restaurants and monuments. Has many amenities (washer, dryer, iron and ironing board, dishwasher). Jon was very communicative and texted to make sure we got in okay. He also let us check out a couple hours later so we wouldn't be so rushed. A bit of a tight squeeze for 7 people, but we can't complain, as the rate was far more reasonable than a hotel would have been. Jon's appartment is a perfect place to stay while working or spending a vacation in D.C. Spacious and comfortable. Swift and smooth communication with Jon. Awesome apartment in a great location. Jon was very helpful and I would definitely recommend. Jon was a great host and we had a very nice stay in Washington DC. The location is really top notch within walking distance of everything with lots of good food options near by. Looking forward with staying there again on our next visit. Jon's place was a great home base for our family of 4 during our trip to Washington, DC. The location is perfect--it's within walking distance to the National Mall, Chinatown, Metro stations, a Safeway, and much more. The apartment is basic and clean, with a small yet serviceable kitchen, a large bathroom and a cozy living room area. The bedrooms are comfortable and the linens soft and fresh. Jon was available if we needed him. We had no issues but I did ask him for a restaurant recommendation, and he replied quickly. We would definitely stay here again. This cozy two bedroom apartment is near union station, H st. corridor, Capital Hill, Chinatown, and so much more. Comes equipped with all household items you may need. I do not live on in this apartment but I am nearby so I can assist with anything you may need during your stay. The space has amazing amenities from a rooftop pool, 24 hour gym, pool table, shuffle board table, and a yoga studio. It has all you need within the apartment from pots and pans to extra towels. We are built on top of a Walmart so you have quick access to grab those items you forgot when packing. Walking distance to union station and Capitol Hill. It's easy to get everywhere on foot. Judiciary Square Metro less than 2 blocks away and Capitol Hill and the Capital One Arena walking distance from our front door. At our central location, you are MINUTES from Gallery Place in the heart of Chinatown neighborhood, which offers fine dining, shopping and fabulous entertainment options. Features a rooftop heated swimming pool, rooftop lounge with grilling areas, yoga studio, and fully equipped 24-hour fitness studio you will live in DC luxury! This 2 bedroom apartment is newly setup in and is fully furnished to make your stay enjoyable, includes central air, washer/dryer combo, fully stocked kitchen with dishwasher, dishes and utensils, cable, internet, flat screen TV, linens, towels, hair dryer, iron and ironing board. 2 double beds in one of the bedrooms, and one queen in the second. Two single fold up beds and two air mattresses available for extra guests. This is a top of the line building with a rooftop pool and Jacuzzi, a second rooftop dedicated to grills and seating areas, a 24 hour business center and a 24 hour fitness center with yoga studio next door. Parties with guests who aren't included on the booking of any kind are strictly prohibited (10 people max). Video of the unit can be sent to you prior to booking, please send an inquiry. Easily walk everywhere: 2 blocks to Chinatown Metro (Red Line), 1 Block to New Cinema Complex with Haagen Daaz, Clyde’s Reataurant, Rosa Mexicana, Lucky Strikes (fun nightlife bowling center with bar and billiards), Verizon Center, museums, restaurants, pubs, Capitol Buildings and Library of Congress, Department of Energy. You don’t need a car! Walk to everything! Also one block from one of DC's Capital Bikeshare stations and numerous bus lines. Great new hip restaurants- Busboys and Poets, Kushi Sushibar, Safeway grocery store and nightlife nearby, and I’m more than happy to offer recommendations on where to go and/or what's happening around the city. Future travelers that stay here in DC will have all the comforts of home, a beautiful apartment, plenty of space, awesome amenities in the fabulous building and a wonderful host in Mark!!! quiet place to relax after a long day. It was over advertised and they under delivered. Apartment was not clean and nobody came to clean until 10:45pm. Air mattresses did not work. Directions were non existen for entrance to garage and unclear on how to use garage. Number of advertised beds is not correct. Mark's place is really great, fantastic location for downtown DC, great price for a 2 bedroom unit in a nice building. Would definitely recommend and stay here again. Well...Usually, I give every place a 5-star rating. I recognize that being an Air BnB host is probably not the easiest thing and requires a significant investment in time and resources. In that spirit, I would feel too guilty to give this rental a 2-star rating, although that is probably closer to what it deserved. Allow me to break down what went into my thought process. The Good: -Great location. Right on Massachusetts Ave, this place is central to anywhere you would want to be. -The patio is fantastic and I am sure that if there is nice weather it would be a wonderful place to relax. -Large and functional kitchen. The Bad: -The beds and sleeping arrangement leave quite a bit to be desired. In one room there is a queen bed but poor lighting and no windows. In the other room, two beds are arranged in a "head - toe/ toe - head" offset manner. While this isn't a problem in itself, the beds are very uncomfortable and I ended up sleeping on the couch each night. -The patio has no furniture so even if we had a nice day there would be no way to go out and relax. There is a public area available for all the residents of the building, however. -The decor, or lack thereof. The was are all blank and there is no character to the place. Even a tiny bit of color somewhere would tremendously boost the appeal of the place. A larger TV could help guests overlook this as that would provide some sort of feature. -Toiletries and goods: While I know most of these are not required, stocking on the absolute cheapest required goods available is not a good sign. Any other "homey" touches are absent. -The space itself is okay for 3 adults but was still cramped with the oversized couch. I think this place would be great if it were redesigned for 2-4 adults. Attempting to fit as many people as possible is not the best strategy. -The Water......we had none our last day. Fortunately, the water in the bathroom for the gym on the first floor was working so we took sponge showers in the stalls before we departed. It took too long to get in touch with anyone and I was unable to get an actual answer for what was going on. I feel it would be a disservice to other travelers to leave anything less than an honest review. And if you are looking at this place for yourself, our experience is likely not indicative of how it will be in the future. For us though, enough negative small things (and some not so small) added up to a poor experience. Mark was a very pleasant host though. He was nice to communicate with when we were able to reach him. Loved the apartment and the location. Wish we could have used the hot tub and the other rooftop lounge, it was a but cold out. Very nice views and so convenient to everything. TV was great with Amazon and Netflix for unwinding after a long day of exploring. Also liked the fireplace. Lots of room for our family, very comfortable. Enjoyed the bar downstairs. Mark was very responsive when we had some issues at check in and check out. Would stay here again. New Building built in 2005, a safe building with 24 hour front desk security. The apartment has never been lived in, includes central air, washer/dryer combo, fully-equipped kitchen with dishwasher, dishes, cable, internet, 1 flat screen TV, linens, towels, hair dryer, iron and ironing board. One bedroom apartment plus open den area two blocks from Union Station in NW DC Downtown. Only 3 blocks to the Convention Center (safe walkable blocks) Parties of any kind are strictly prohibited. Easily walk everywhere: 2 blocks to Chinatown Metro (Red Line), 1 Block to New Cinema Complex with Haagen Daaz, Clyde’s Reataurant, Rosa Mexicana, Lucky Strikes (fun nightlife bowling center with bar and billiards), Verizon Center, museums, restaurants, pubs, Ca pitol Buildings and Library of Congress, Department of Energy. You don’t need a car at all...walk to everything. Also one block from one of DC's Capital Bikeshare stations and numerous bus lines. Parking also available in nearby parking lots and garages. There's a queen sized bed in the bedroom, and comfy sofa bed in the open den for extra guests. There is a large walk in shower and separate tub with another shower and walk-in closet. Also, there is a powder room in the living room area. Sleeps up to 4 people comfortably. Great new hip restaurants- Busboys and Poets, Kushi Sushibar, Safeway grocery store and nightlife nearby, and I’m more than happy to offer recommendations on where to go and/or what's happening around the city. Full private use of the entire apartment with brand new kitchen, living room, private full bath, secure wireless internet, cable TV with DVD, No washer/dryer and No dishwasher for guest use. Paid parking nearby. Building has a rooftop but access is for permanent residents only who are staying 6 months or more only. Clean sheets, towels, soap, shampoo, lots of tourist maps/info, etc provided for your stay. Please note that the front desk staff is not at the use and disposal of guests during your stay. This is a condo building. You are renting a private home only and no building amenities. Unlike a hotel, the desk staff are not present to service guests. They do not store luggage, maintain the property, give directions, permit roof access, etc. They are strictly there as door personnel for the condo owners. I do not want to represent that they are in any way like a hotel's front desk, so please understand this when booking your reservation. Also, please bring personal items such as toothpaste, soap and shampoos. Due to allergies and personal preferences, we do not provide these items. As your host, I will go out of my way for your convenience in any way possible. If you are interested in staying, please fill out your profile so that I may get a little acquainted with you. Tell me why you are visiting DC, how many people in your party, and a little about yourself. Just as we share information and pictures assuring you of what to expect when staying, we would like to know a bit about all our potential guests just to keep the place wonderful for every guest. For security purposes, if you book, we will require a photocopy of your identification before your visit and a refundable $200 security deposit. This neighborhood is very safe and walkable. You can walk to neighborhood to great restaurants, the convention center,cinemas, theaters, sporting events, grocery stores and great shopping. Très bel appartement décoré avec goût, correspond aux photos. Arrêt de métro à moins de 5 minutes. Chinatown au coin de la rue. Cependant, la piscine apparaît sur les photos mais nous n’y avons pas eu accès en tant que locataires. Pas de contact direct avec Nat. Nous avons dus récupérer les clés dans une Keyboard dans un bar. Unser Aufenthalt war super. Alles war sehr sauber, modern und ganz genau wie auf der Seite beschrieben. Nat war sehr hilfsbereit und hat alles in Ihrer Macht getan, damit wir uns wohl fühlen. Wir haben alle Sehenswürdigkeiten zu Fuß geschafft. Wir würden jeder Zeit zurück kommen und in dieser Wohnung bleiben. Thanks Nat! Great place to stay! Unbeatable location and very stylish decor. Extremely clean as well. Would definitely stay again if I am ever in DC. The great location and the size of the apartment were the reasons we decided to stay at this listing. And we weren't disappointed on that front. However we did have some issues with the apartment. It is worn down from wear and tear and most of the amenaties are dated. Most of these issues came to light because we stayed for an extended period of time and not just a couple of days. If you are only going to be in town a few days you probably won't notice them. I don't think that you will find a better value. Location is the key, close to the mall, right on numerous bus lines, close to a metro station, and lots of restraunts and stores nearby. We would reccomend this listing to friends and if we come back again we will stay here if it is available. We weren't able to meet Nat as she was out of town but her assistant, Albert, was lovely. He was very helpful and gracious. Nat's apartment is very spacious and is in a central and convenient neighbourhood. We were lucky to have amazing fall weather, and took advantage of her fantastic roof. We were in DC on business, and it was so nice to be able to come back to a proper home at the end of the day. Thanks, Nat! This apartment is absolutely superb. Everything you could want. It's spacious, has lovely furniture, a huge bathroom, great kitchen. There's a gym and pool you can use. Just brilliant. Nat was great and really helpful. This apartment is a gem in a great area of town. It's just outside of China town and only 3 blocks from the nearest metro station. The apartment is in a very nice and recently built building. It's very cosy, clean and provides all amenities that one could want. The roof of the building provides a gorgeous panorama of the city that can't be missed. Around the entire rooftop are chairs and tables to enjoy the view along with a pool and more private alcoves for quiet conversation. I dare anyone to find a better all around place to stay for the price that's offered! The next time I am back in DC, I will definitely try to stay here again and will recommend this location to my colleagues. New Luxury Downtown Private Apt. THERE’S NoMa PLACE LIKE HOME. WhyHotel 1st + K puts you right at the epicenter of the rising NoMa neighborhood and everything Washington DC has to offer. The apartment is complete with all the upscale amenities you should ever need for a comfortable stay. Our studio is the perfect place to unwind after the hustle + bustle of exploring the district. True to it's name, the studio is one big room with a luxe queen bed, gourmet kitchen, plush sofa bed, SmartTV and more. Enjoy! SO MUCH TO LOVE: - 24/7 WhyHotel hosts - Relaxed and stress-free, check-in experience - Brand new luxury apartment building - KitchenAid stainless steel appliances - Quartz countertops - Soft-close white Shaker cabinetry - Hard surface flooring throughout - In-home washer and dryer - Air conditioning - Keyless apartment entry - Elfa closet systems And so much more... This is home like you’d never expect to see in a hotel. Hit the Fitness Center. Whip up a home-cooked meal in your fully-equipped kitchen. Kick back on your oh-so-plush sofa and binge-view some of your favorites with Chromecast. With WhyHotel, you’ll love the way you’re staying in Washington, DC. This is more than a hotel, it’s a home, away from home. Washington DC’s NoMa is a vibrant neighborhood: walkable to Union Station, the NOMA/Gallaudet Red Line Metro Station, vibrant H Street NE corridor, Capitol Hill, Union Market, Shaw and Mt. Vernon Triangle neighborhoods. The location offers great proximity to food venues, entertainment, art installations and new amenities delivering every day. WhyHotel 1st + K is located in the heart of it all with easy access to the surrounding neighborhoods hottest spots and nearby Metro. Very excellent and professional service. We really appreciated the cleanliness and attractiveness of the apartment building. The space was brilliant. Everything i could've needed and wanted. Clean, open, modern. WhyHotel provides a professional twist to Airbnb that I hadn't seen before. There is a 24 hour per day "desk" that allows the visitor to check in and out and make other requests as needed. The space is super clean, nicely decorated, and provides all the amenities one would expect from ironing board to charging ports for my electronics. It feels like a hotel to me. Very good stay. Great location adjacent to DC's Union Station and the Metro Red Line. Also just a short walk to Capitol Hill. Was much nicer than I expected. Please note that a lot of the units are close to the train tracks for Union Station but I really love trains and the sound wasn't too much with the thick windows. I'd definitely stay again! Located three blocks from the Convention Center. Vibrant Chinatown, the Capital One Arena, CityCentre and Capitol Hill are also literally steps away. This is the perfect business or sightseeing rental for people who demand top quality in where they stay. Mt. Vernon Triangle boasts restaurants, neighborhood bars, coffee shops and everything the business traveler or tourist could possibly imagine—all within 5 minutes or less walking. Public transportation abounds and museums abound as well. The building is less than 10 years old and the quality of the fittings are outstanding. Large one-bedroom with a pull out couch in the living room make this an easy place to stay. If you want a night in, you’ve got plenty on the televisions with full access to cable TV. This building is close to so much of what’s happening in DC right now. If you want to see the museums, you can walk to most all of them. If you are here to see the Wizards or the Capitals, you’re a 5 minute walk—just add in time to soak up the experience with all the fans! If you like to walk, from here it’s a 5 mile loop to walk around the Capitol, down the Mall all the way to the Washington Monument and back. The gym is located on the 2nd floor; it’s pretty good! Looking for a corner bar where everyone will know your name after three days? That’s Silo on 5th between Mass and K. Coffee? Omg there’s too many places to list. Phil's place is great--conveniently located, spacious, and fully stocked with everything you need/want! I was surprised to find things like bandaids, kouthwash, q-tips, lotion, etc. Also, Phil responded to all of my messages so quickly and was super helpful. I highly recommend staying here. Phil's place was amazing! What a great location. Definitely in a ritzier part of town so be prepared to spend some dollars at restaurants and bars in this area, but it is well worth it! Did I mention the two pools?? So awesome! They were a must when we were there!! Its a great place, clean, tidy, kitchen equipped with everything, nice view from the roof, strategically located. I recommend it! This is a fabulous location. We enjoyed looking at his travel guide book for restaurants. We used the Circulator bus line to see mall area. I can't say enough great things about Phil's place. My wife and I stayed for a long weekend to explore DC. The location was very convenient to everything we wanted to do. We were a short distance from the train station, we walked to Capital One Arena for a Wizards game, and that doesn't begin to describe all the great restaurants in site. At the end of the day Phil's place felt like home. We hope to get back to DC and hope Phil's place will be available. Great location. clean place. I wish I had the time to stay longer! The airbnb was perfect , we definitely enjoyed our stay. We were very close to a lot of food places. Everything was just awesome! The pool on the rooftop was awesome, the apartment was super clean, the shower was great, the bed was super comfortable !! I really enjoyed my stay, Im looking forward to coming back. Right by the Gallery Place Metro, the D.C. area is just a quick ride away. When you’re not shopping around the vibrant streets of NoMa, or snacking your way through Union Market, relax in our comfortable suite. Work Your Way Our apartments are designed to help you do your best thinking. Featuring bright expansive spaces and complimentary high-speed WIFI, you’ll have everything you need to be your most productive. Relax & Rejuvenate When your day is done, reset and kick back in a space that is created for unwinding in every way. 24/7 Suite Support If you have any questions or concerns throughout your stay, we have a 24/7 Suite Support team that’s always just a phone call, text, or email away. We’re sorry, but no smoking or pets allowed. We really enjoyed our stay! The apartment was wonderful, very comfortable and about a 10-15 minute walk from the National Mall. Locate in the heart of DC, 15 minutes walking to many attractions. Walmart & Starbucks are down stairs. Perfect place for tourist. There are many nice touches here: white noise machine and ear plugs for light sleepers not used to big cities, filtered water in the fridge, an elaborate workout room that is available, as well as a game room with pool table and foosball. The location is an easy walk to Union Station and the US Capitol. There's a WalMart next door where you can buy anything you need, or you don't need. This place was awesome! The details about our stay were so specific and exact that we did not have to contact parallel for literally anything. Everyone working the desk in the lobby were super nice and helpful. The game room was very fun and the other residents were nice. The room was extremely clean and cozy. The neighborhood was lively and had several places to eat in close proximity. The biggest feedback we had was that there were limited channels and no Netflix. Being that our stay was so short it wasn’t the biggest issue because we spent a lot of our time out and about, but just something to be aware of before you stay. I would stay here again without thinking twice. Lovely space. Comfortable bed. Walmart is conveniently located next door and it’s very easy to get to from DCA. Great place to stay. Very nicely decorated and clean. Good location with a Walmart next door for anything you need. Luxury living in this DC gem! Amazing amenities including roof top pool, first class gym and clear views of the skyline and the Washington Monument. In addition to all of the neighbourhood's shopping and dining destinations, guests also enjoy access to all of the buildings lounges and common spaces, as well as lush garden retreats. There's something special for everyone at 425 Mass Apartments -- the pinnacle of luxury living. Welcome to vibrant Mount Vernon Triangle! With easy accessibility by public transit and nearby highways, this uniquely looking neighbourhood offers you walking distance to some of D.C’s most diverse businesses and restaurants. You will be living within walking distance of Chinatown, Capital One Arena and the Convention Center and just a short metro ride from Georgetown, Downtown D.C. and Dupont Circle. With a rooftop boasting two pools, 3 grills, an outdoor television and with the Capitol and Washington Monument in full view this community offers THE best rooftop in Washington D.C. Full private use of the entire apartment 2BR/2bath with brand new kitchen, balcony, living room, private full bath, secure wireless internet, cable TV with DVD and washer/dryer. Building has a rooftop with a beautiful view. Clean sheets, towels, soap, shampoo, lots of tourist maps/info, etc provided for your stay. The gourmet kitchen is fully equipped with everything you need including dishes, glasses, cutlery and pots and pans. The kitchen features full-size stainless steel appliances (four burner stove, oven, microwave, dishwasher and refrigerator), toaster, and coffee maker. Coffee, and sweeteners are provided. The check in process was very easy and the directions super detailed. The building is very nice. Bonus with underground parking a major plus for the city. Great response to questions. Location, location, location!!!! This place has a great location but there was no hot tub as described. Check in was also difficult, despite the videos/instructions. Location! Location! Location! This downtown apartment in the beautiful 425 Mass apts was absolutely perfect. I was able to walk everywhere within a 5 minute timeframe. This gem also came with parking inside a garage. That is rare in downtown D.C. Very private space with adequate sheets, pillows, and kitchen utensils. Mark was very responsive and even let me add an extra day at the last minute. perfect place. I will definitely be staying here again when I come back to D.C. This furnished Blueground apartment is located in Mount Vernon Triangle, a flourishing and vibrant DC neighborhood that combines business and pleasure with an array of boutiques, local eateries and scenic parks. Situated between the trendy Shaw neighborhood and the hustle and bustle of downtown, the location makes it very easy to walk everywhere and explore the unlimited dining options and nearby nightlife. Our luxurious apartment is just a short stroll away from Walter E. Washington Convention Center and a 10 minute walk from both Mount Vernon and Gallery Place Metro stations. This 2 bedroom / 2 bathroom apartment is central to all of DC's major attractions. The apartment has all the amenities you may need, but what you will love is the Rooftop pool and deck with skyline views. Capital One Arena, Museums and Monuments are within walking distance. Enjoy being steps away from a 24 hours Safeway grocery store, shopping & restaurants, Busboy & Poets, Ray's Hell Burgers, Farmer's & Distillers, and Taylor subs. One Free Parking space is included beneath the building. This beautiful apartment has an open floor plan living room, dining room and kitchen. The master bedroom features a comfortable queen bed, while the second bedroom features two twin beds. The sofa and couch in the living room provide sleeping for another two guests while, we also provide two air mattresses. Mount Vernon Triangle neighborhood has a unique look to it mixing modern and historic architectures and landmarks, and we're within walking distance to some of D.C.'s most diverse businesses and restaurants. If you want to be within walking distance to Chinatown or a short metro ride from Georgetown, Downtown D.C. and Dupont Circle and experience all that these areas have to offer, then this is the place you want to call home away from home. Great and sizable space in a central location! Fantastic place to stay. 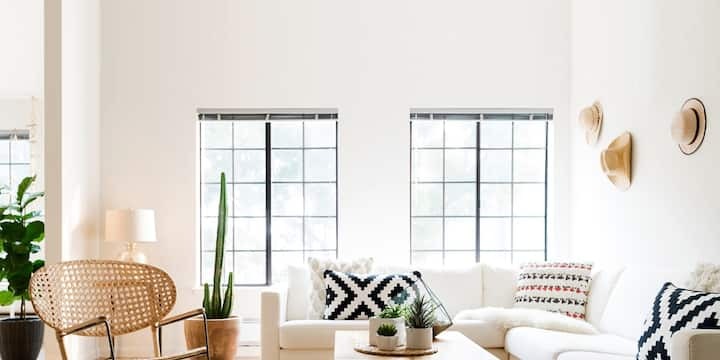 Large windows making it easy for light to brighten the space. Very clean and tidy. Quick responses from the Host making the whole process a lot easier. My place is located at downtown DC. It is only 3 mins-walk to 3 line metro stations. Easy access to Reagan national airport, most famous tourist places, sport event, concert. It's in a very safe and vibrant neighborhood with colorful daytime and nighttime events. Entire unit is very spacious, efficient and fully equipped. Although bedroom is small, it has a huge King size bed and private closet. The unit is facing back alley and on upper floor. Usually it is very quiet especially bedroom. My place is good for business travelers, tourists, couple without kids. Vibrant downtown neighborhood, colorful nightlife, tons of restaurants, many galleries and museums. Wei was amazing! She communicated with us every step of the way. Her home was delightful and clean. It's also in a great location with several cool bars next door and across the street. If you're a basketball or hockey fan, the stadium is directly across the street. There were games both nights that we were there and the crowds were lively and friendly. If you have a car, you will have to pay at least $25 a day in a separate parking lot near by. We would definitely stay here again. Thank you Wei. Great place! Clean, stylish, close to attractions and everything you could want for a trip to DC! Great value for the space, roof top area and view, fitness center and proximity to DC tourist attractions and restaurants, but not the place if you like peace and quiet because of a loud neighboring roof top bar/restaurant that closes at 2:00 am. Parking options were not communicated well before and during check-in. Large, bright and open 2br/2ba apartment in prime location! This apartment has contemporary decor, luxury mattresses and is fully equipped for a comfortable stay. The top notch building has a roof top pool, gym and lounge area and is just steps to shopping, dining and great nightlife on the H Street corridor. Walking distance to the Capital, museums, Union Station and lots more. A roomy, stylish apartment that is fully equipped for a comfortable stay. There are two large bedrooms with deluxe mattresses for your sleeping comfort. Two full baths (one ensuite) with shampoo, bodywash and fluffy towels. The kitchen has all the essentials and there is seating for 6 at the dining room. The living room has a large flat screen TV with basic cable. The apartment has a washer/dryer in the unit. The apartment is in walking distance to so many of DCs attractions and a short taxi or metro ride to anything else. Less than a mile to the U.S. Capital, Smithsonian Museums and Walter E. Washington Convention Center. Shopping, dining and nightlife abound nearby along the H Street Corridor. This place was fantastic, and I have a high bar! Check in process was super simple, and the place was lovely, spotless, with great special touches throughout. It was a really good size with two full bedrooms and two big bathrooms, and the apartment itself was right next door to an amazing gym and lounge in the building. This was an overall great general location. The neighborhood is just a few easy blocks to walk to Union Station and the Capitol, and an easy walk to some great food spots (Sixth Engine, Wise Guys Pizza, Busboys and Poets). I would highly recommend staying here to future guests. And Cali was super responsive about checking in with us when we arrived. Great weekend getaway! A great location - an easy walk from Union Station. The apartment is just as it looks in the photos - spacious & clean. The apartment is well equiped, except there is no toaster & Team Cali [an agency - not an owner] could not provide one. There is a Walmart nearby with all one needs for self-catering. We had to wait until 4pm to check in & were told we could not enter the building before this time. The apartment building has a pleasant foyer with comfortable seating & it would have been far more pleasant waiting there with our luggage, rather than at Union Station, where it was going to cost us $10 a bag to store our luggage for 2 hours [a "small fee" to quote Team Cali]. The apartment is comfortable, however, we were disturbed by the people above walking around at all hours of the day & night. Otherwise, it is a fairly quiet & convenient location. Some local information would have been helpful. The apartment is really clean and spacious!!! The apartment is nice, but the walls are thin and it was a long, noisy night. Great space at an amazing cost! Was happy that I could get groceries on the same block and have snacks for my stay. Upstairs neighbors are a little loud through the night and into the morning. The unit is located right next to the building amenities so you can hear folks coming and going through out the day but was not an issue for me. I’d stay here again for sure. Perfect location for my event at Georgetown law! Great apartment, comfy beds, large bathrooms. The host was very responsive and we enjoyed our stay and visit to DC. This property is ideal for individuals who want to have easy access to the tourist sites of DC. The building is quite nice with many amenities, such as a gym and lounge area. The apartment is clean and comfortable. It matched the pics online perfectly. Although there were some homeless people around the neighborhood, the building was secured and the only access was through using the key fob that was provided or through the concierge. Overall, this property is excellent. 숙소 자체는 크게 나쁘지 않지만 처음 도착했을때는 룸을 찾기 조금 힘듭니다. 고장난 조명들이 좀 있어서 밤에는 부엌이나 다이닝공간이 좀 어두웠고 호스트 답변은 느린편입니다. 심지어 퇴실 후에는 문의사항에 답변도 없습니다. We had a great time at the apartment, which was large, comfortable, with very comfortable beds. The kitchen was excellent, good stove, refrigerator and dishwasher. Good shower, lots of light in every room, enjoyed the sunset when we were there to see it from the 4th floor. Nice pool, good to have in Washington's hot, hot weather. This was clearly fabulous and exceeded our expectations. The coffee machine and coffee supply was great. Everything great about Washington DC was close by - either by foot or by Metro. 5 stars all the way! Great space. Great location. Exactly as advertised. If you’re looking for a stylish weekend getaway home, this is it. Would definitely come back again. Incredible views, beautiful building and top shelf of luxury DC living. Rooftop come with stunning views overlooking the capital, Monument and DC. Comfortable furniture designed with passion and awesome for families, friends, couple, and business travelers! Building is full with amazing amenities This building one of the most elegant & newest building in DC, and we look forward welcoming you there! Best neighborhood in DC. You are a 10 minute walk from Capitol Hill, Smithsonian Museums, Washington Monument, the Convention Center, the Verizon Center and Union Station and other metro stations. This large top-floor 2 bedroom, 2 bath is very bright and spacious. Large windows with shades open up to an amazing city view. Modern furnishings and comfortable mattresses make this sparkling home a great place for business travelers or vacationers. The luxury building has a stunning rooftop pool and BBQ area, complete gym, yoga studio, pool table and much more. Walking distance to Union Station, US Capitol, museums and restaurants. The secure building features luxury amenities and onsite parking available for a fee. Centrally located, the home has: Walk Score 98; Transit Score 92; Bike Score 83 with available rental bikes and electric scooters (Bird and Lime) nearby. There is a Walmart SuperCenter next door with full grocery store including fresh fruits and vegetables, the perfect location to provision the unit for your stay. There are also many local restaurants and delivery services. Coffee and tea are provided in the lobby for free and there is a Starbucks next door as well. The bathrooms have large white towels, shampoo/conditioner, body wash, hand soap and hair dryers in both bathrooms. Bel appartement très confortable et très bien Situé. We really enjoyed our stay at Rover's place! We had originally booked into the 4th floor apartment, but we requested an early check-in, which wasn't available for the 4th floor apartment, so Rover was flexible enough to move us to a 2nd floor apartment instead. So this review is about the 2nd floor apartment. It was clean and spacious. Comfortable beds. Quiet despite being in a busy location. Rover was very prompt in his responses and sent instructions and info well in time. We took the train in to Union Station and walked -- it's barely a 10-12 minute walk. Very convenient. Thanks for a wonderful stay! Every bit as valuable as I’d imagined. My girlfriend was extremely comfortable. Wal-Mart and Starbucks just downstairs added to the abundant convenience ! This apartment is fantastic for anyone traveling in DC! It's walkable distance to everything. With a Walmart downstairs, we were able to quickly pickup items for breakfast. I even got in a workout in the gym! Highly recommend. Very spacious and roomy. 2 master suites with full bathrooms and closet space. Huxley Hospitality is proud to present this modern condo with first class amenities complemented by sleek design, upscale fixtures, high ceilings, rooftop pools with private garden retreats and resort-style lounge areas along the D.C. skyline. Our convenient location is walking distance to the Metro, shopping and restaurants. The Capitol, K Street, Penn Quarter, Chinatown, Judiciary Square and Gallery Place are right outside your door. **Please note this unit is currently undergoing its annual upgrades. Photos will be updated once completed (Feb 2019) Our famous interior designers spare no expense when decorating the suite with your comfort and luxury in mind. This newly built condo is spacious with over 1000+ SF with two bedrooms and two bathrooms and a full size kitchen and living space. The Space: *Bedroom 1: Plush queen bed with comfortable mattress. *Bathroom 1: Tub/shower combo (ensuite) *Bedroom 2: One full/twin bunk bed (sleeps 3) *Bathroom 2: En-suite, full bathroom with shower only. *Living/dining area with seating for up to 6 chairs. One sofa has a queen pull out bed. *Twin cot available. Kitchen is fully stocked with designer cookware, utensils, dinnerware including glasses for up to 8 guests. Includes: toaster oven, Keurig coffee machine with starter pods included, teas and basic cooking supplies. All units are fully equipped with freshly laundered linens on beds and towels including beach towels for the pool. Extra bed linens as well as extra pillows and blankets for the pull out and cot mattress. One bath towel, one hand towel and one wash cloth per guest per stay. Unit will be stocked with starter gourmet/organic coffee and tea, sugar, and toiletries (soaps, body wash, body lotion, shampoo/conditioner) and toilet paper . Hair dryer, iron and board available in every unit. The building: *High security building with electronic access doors to unit and amenities including elevators. *24 Hour Gym *Lounge area with free WiFi *Rooftop pool (seasonal) with lounge area and fire pits. *Maximum of 4 guests in pool per unit. Rooftop is first come , first serve availability. *Outdoor rooftop has gas grills . Great location. Very nice host. We loved our stay here. We took advantage of the small pool as well as the game room (billiards, fuseball, table-top shuffle board) as well as the gym during our stay. It was a 15 min walk to the capitol. I would recommend this condo to my friends. Lovely place. Very clean. Very spacious. Close to everything. Full size kitchen with all amenities we could want and more. Would definitely stay here again. Such a beautiful apartment and not to far from the beautiful H St corridor and Union Station. Beautiful building and nice, easy to navigate area. Highly recommend staying at this condo! It’s beautiful, clean, great location and the hosts were amazing!!! This space was truly a great experience for our family. It is close to bus routes and Metro and so is accessible to everything we wanted to see. Communication was great and timely, and the space was perfect for our needs. We felt very safe in the building. Best of all, the pool saved us as the temps were in the mid to high 90s all week and our kiddos could always have a treat to look forward to at the end of the day. THERE’S NoMa PLACE LIKE HOME. WhyHotel First + K puts you right at the epicenter of the rising NoMa neighborhood and everything Washington DC has to offer. The apartment is complete with all the upscale amenities you should ever need for a comfortable stay. Our space is the perfect place to unwind after the hustle + bustle of exploring the district. True to it's name, the two bedroom apartment has two luxe queen beds, gourmet kitchen, plush sofa bed, SmartTV and more. Enjoy! SO MUCH TO LOVE: - 24/7 WhyHotel hosts - Relaxed and stress-free, check-in experience - Brand new luxury apartment building - KitchenAid stainless steel appliances - Quartz countertops - Soft-close white Shaker cabinetry - Hard surface flooring throughout - In-home washer and dryer - Air conditioning - Keyless apartment entry - Elfa closet systems And so much more... This is home like you’d never expect to see in a hotel. Hit the Fitness Center. Whip up a home-cooked meal in your fully-equipped kitchen. Kick back on your oh-so-plush sofa and binge-view some of your favorites. With WhyHotel, you’ll love the way you’re staying in Washington, DC. This is more than a hotel, it’s a home away from home. Great location for a large group. We parked on the street, as it has holiday season , parking was free. The place was clean and close to all the museums and monuments we wanted to visit. Condo was even bigger, comfortable and nicer than the photos. We rated it five stars. The only thing that visitors should be mindful of is that given proximity to Union Station, the trains are a little loud. It’s not a nuisance really but if you’re a light sleeper, bring ear plugs for the night and it’s fine. (Why Hotel also provides free earplugs if you need them). The location is perfect and the building is very nice. The Why Hotels office is open 24 hours, which is super convenient if questions come up. Also, we came during the holidays when there was tons of street parking, but there also a few cheap long term lots near by. Incredible location, amenities, and hospitality! Beautiful, modern, spacious, spotlessly clean, comfortably furnished apartment. The building is secure, beautiful, brand new with very helpful staff and lovely accommodations like the gym and well decorated gathering spaces both indoor and out on multiple levels and a fire pit. Garage parking is secure and easy to access below the building. 100K is surrounded by new buildings and development in the city. We had a fantastic time and would highly recommend 100K and WhyHotel to other travelers. Nice and simple apartment with quick access to train station. Not in the heart of DC, but quick uber or walk to all site seeing and restaurants that you need. This cozy studio is the perfect mix between comfort and practicality. You have the entire place to yourself. Hardwood floors and a rug for comfort. Full Kitchen with updated appliances, coffee maker, toaster and microwave. Queen size bed, queen size pull out bed, and a desk for work. Cable and High Speed internet. Upgraded Shower-head in the bathroom for relaxing showers. A safe in the closest for added peace of mind! Appartement vraiment très bien placé pour les visites. A quelques mètres du Capitole et proche de restaurants et d'un Walmart. Brilliant location for sightseeing. Good food locally. Easy to get to. Comfy bed. All amenities provided. Sarah's place was great, it was as described and in an excellent location! It’s wonderful location and room! In my opinion, it’s the best location for travelers! Sarah's place was accurately described. A few minutes walk from the Capitol was a plus. The pullout sofa bed was as comfy as a regular one and Sarah was a thoughtful host and the communication was quick and efficient. Her home was clean and very cozy. Would love to come back for another visit when D.C weather gets better! With the Union Station just around the corner and the National Mall in walking distance, this AirBnB was the perfect place to discover Washington. The studio gets very small if you also use the couchbed, but that was okay for us as we‘ve only been there sleeping. The beds are quiet soft, so depends on what you like best. The heater was very warm so we had to regulate the temperature to cool down via the AC (little bit noisy). Noises outside weren‘t of any problem, if window is closed. Despite some minor shortcomings, we can recommened this clean, well equipped and super located place for your D.C. exploration. Great location! Walking distance to the Capitol and a block from Union Station! Sarah was a super host and communicated early to make sure everything was set. Easy instructions provided for check-in. Building is secure and quiet. My studio was just as described, comfy bed and had coffee in the pantry! Highly recommended! Lovely apartment! Well maintained and spotlessly clean. Much-appreciated small touches, such as laundry detergent and dryer sheets, kitchen scrubber, dish soap, etc. You need to understand how to work Nest for temp (not too hard). Also, if you want to sit on the sofa and work on your laptop, most people won't be able to. It sits very high, doesn't let you 'settle in', and the laptop slides off your lap (I'm not short either, at 5'8"). The coffee table is also super low so is no help. Other than that, it's an excellent facility that's beautifully maintained in a great location (for my business needs). Parallel was pretty easy to work with and helpful. I will return! Good stay, great building. Excellent communication before check in. The apartment is really nice and check it was super smooth. I was only there for 2 nights for work, but it was the perfect place to relax after a long day. Like, I really like that they had nicer soaps/lotions available and fluffy towels! Although I didn't need to reach out, Lyric seemed to be very communicative and interested in making me feel welcome. Thanks for the nice stay! Excellent location, amenities and value! The place is exactly as pictured only with finer details than you would have imagined. High quality towels in the bathroom, filtered water in the fridge, makeup wipes on the bathroom-- no convenience overlooked! I would definitely recommend staying here. Great communication. Great location. Walmart right in the building. Apartment was lovely and really close to the 2 pools (one a foot deep, the other 3.5 foot deep) and terrace area. Location is reasonably close but with 2 small children we opted for Uber everywhere as subway a bit too far. Great location and very stylish home! Great comfortable and stylish place to stay for business and/or tourist travel. Short walk to Union Station or Chinatown areas. Access to the gym and pool was a great bonus. Would definitely stay again. A stunning home that is comfortable and functional. The unit has superb windows that let in tons of natural light and the layout is wonderful. The hosts ensured everything was perfect during my stay. Easy check-in. Impeccably clean with great amenities. I was surprised how quiet it was. Very stylish apartment, safe building, friendly staff. Close to national mall and walking distance to museums. Great place in a good location. It’s a modern apartment like much of the new construction in DC. Lyric requires and extra form so be aware and respond. Very clean and comfortable stay. Wonderful apartment, Clean, Quiet, Comfortable and well Appointed. My wife and I had a wonderful stay in this apartment. Great place to stay, highly recommend ! Good position, clean and good furniture. Thank you Lyric! Definitely one of my top airbnb experiences. Beautiful condo in a great location! Great place. Quiet and clean with lots of nice amenities. No strong fragrances and had a very comfortable bed. Had a 24 hour help line hat was very responsive and helpful. Place is just as it is advertised. I definitely would stay here again and recommend to others. A comfortable and functional location walking distance to the capital and Union Station. Overall the place is great. It’s stylist and comfortable and has everything you need. The only issue I had was that the shower wasn’t draining properly. I notified the owner about it right away and they said they would have maintenance take care of it right away. I stayed for 4 nights and maintenance never came to fix the drain, despite repeated requests to the owner. But other than that, the place is great. Very convenient and a great place to stay. I thought this amazing space was too good to be true - but it turned out to be a really great spot!